Thank you for funding our Kickstarter! If you would like to support our documentary please do so HERE. 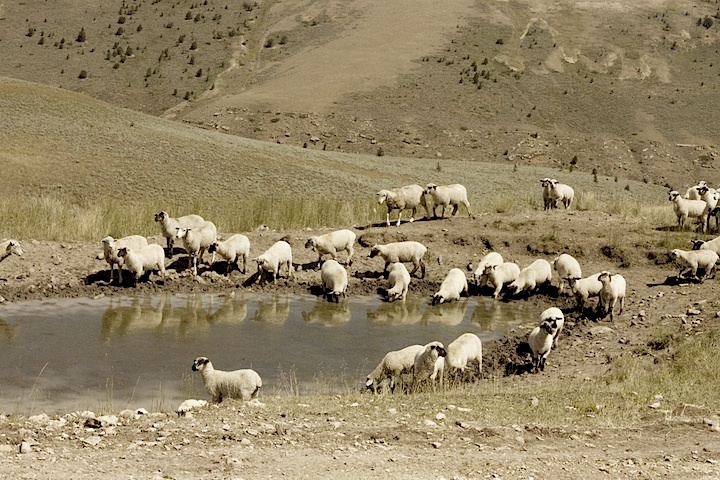 Don and Peto Meike’s family has herded sheep in Johnson County, Wyoming since the early 1900’s. Living the iconic American dream of rugged individualism, the Meikes built their lives on strength and stoicism. Now, with no heirs to their legacy they must part with their ranch and herds. In August 2013 we shot footage in Wyoming for 8 days to create projections for a new opera at the Teatro Real in Madrid. Inspired by Annie Proulx’s stories we searched out and shot a lot of rugged wilderness footage as well as working cowboy culture to create large-scale projections for the backdrop. Coming from the northeast we were blown away by the scale of the landforms and the extraordinary natural beauty surrounding us. The wide expansiveness and texture, the colors shifting from red clay to blue sky to yellow fields. The dryness with the moments of lush and the fields of wildflowers and lavender. Wildlife was everywhere and nature, seemingly untarnished by humanity, was wonderfully close at hand. We immediately understood the desire to be untethered and to roam free, finding ourselves a speck in Wyoming’s grandeur. After searching the internet for a sheep rancher to help us with footage we needed of sheep herds in the mountains, we found the Meike family ranch’s website and immediately emailed Don and Peto Meike, whose family has ranched sheep and cattle and homesteaded in the Big Horn Mountains since 1901. The Meike ranch is located in the tiny community of Kaycee, Wyoming, which, by a lucky coincidence, was celebrating their centennial at the time we planned our shoot. We called Don to arrange a time to meet and he simply said “Just come to the centennial on Saturday and ask around for us. Then we can talk.” Having no cell phone number or set location to meet, and a little worried we may not find him, we made our travel plans on the faith that we’d run into Don and Peto at the centennial. Don and Peto Meike, both in their 80’s, have lived their entire lives herding sheep and ranching in this small part of Johnson County, Wyoming. Living the iconic American dream of rugged individualism, neither brother settled into family life but spent their lives dependent on being able bodied, stoic and strong. Their family has owned their ranch for four generations now and they currently have 700 angus-cross cows and 3,000 Rambouillet sheep to herd into the mountains each Spring. They do this over the course of 10 days, walking them all the way into the mountains where the sheep stay for the summer and then selling them for meat and wool at the end of August. Peto Meike took us up into the mountains the following day to take some footage of their sheep herds. Peto’s eyes are pale blue and his skin is leathery from a life of working outdoors. When we met him that morning he was wearing a large brimmed cowboy hat, faded blue jeans, a flannel and boots. He brought one of his sheep dogs King along, as well as a jumbo sized soda and a bag of potato chips. As he drove us up into the mountains to introduce us to his sheep, he told us stories about his many years homesteading in the mountains and pointed out numerous historical monuments. His monotonous way of speaking can lull you into sleep on a hot Wyoming Day and we immediately relaxed into our bumpy drive through the mountains, eagerly absorbing his years of acquired knowledge. This area of Eastern Wyoming is a land that is still dotted with original homesteads and was the home of the infamous “Hole-in-the-Wall” gang and the Dull Knife Fight as well as the Cheyenne before they were driven out. Peto showed us the mountain that the Cheyenne fled over in the dead of winter, the secret path to the “Hole-in-the Wall” gang’s hideout and the homestead that he lived in during the summers as a child. He also pointed to a segment of the red wall, informing us that paleontologists have been excavating there for dinosaur bones. The town of Kaycee was founded at the epicenter of the famous Johnson County Cattle Wars memorialized in the film Heaven’s Gate and he told us that it took place on the land we were driving through. Although Peto is still quite limber, Don no longer makes the treks into the mountains and it’s getting much harder for the Meikes to keep up this lifestyle. With no heirs to their ranch, Peto sadly informed us they will be forced to lease or sell it within this next year or so. However, Peto also notified us that they’ve recently built an old age home on their property, known as the “Kaycee Senior Housing Project”, as envisioned by their Aunt Anna, who passed in 2008 at the age of 99. It is in a memorial to her parents, Don and Peto’s grandparents, and the Meike Family’s longtime devotion to the Kaycee area. Don and Peto will be opening it up to their community as a way to keep the elderly close to their roots, a place for neighbors to stick together through old age. Don and Peto occupy a role as old as western civilization. A role mythologized since the dawn of written history. They are shepherds, stewards of the land and keepers of the flock. They appear humble, caring individuals with a great love and passion for the lives they have lived as well as for the lives of those in their community. They are also tough, ambitious men who have built a large business and provided jobs for their community. They are experienced, practical people use to separating the lambs from the ewes at the end of every summer to ship them to slaughter. They deal with a myriad of concerns ranging from legal issues with land use and the Bureau of Land Management to managing relations with land-owning investors, many of whom live far away. We’re interested in following them through this major milestone as they transition into a more sedentary lifestyle, as well as capturing their piece of American history and its association with an iconic cowboy identity that seems to be fading away. Our focus will be on how the identities of the Meikes as rugged cowboys and shepherds, stewards of the land, are defined by their role in their community. We want to show how the dependency of the community on them to bring in revenue and create a space for the elderly members of the town to go as they age, is an interdependent relationship. The Meikes, despite the seemingly stoic and iconic cowboy traits they have used to define themselves as leaders, are also dependent on their neighbors and peers for their livelihood.